The most likely coalition? It's already Harper and Trudeau. The recent headlines about the Liberal leader considering a coalition with the NDP, but not while Tom Mulcair is the New Democratic Party leader, was interesting in what it says about the inexperienced politician that is Justin Trudeau. Or about the fact that his Liberal Pary has precious little in common with the NDP. Many of us, including John Ibbitson, writing in the Globe and Mail, wondered why in the world Trudeau would even consider a coalition with the NDP. Historically the Liberals have always found more common ground with the Tories, than they ever did with the social democratic party, and certainly, as Ibbitson points out in Wednesday's column, they seem to be in lock step with Harper on the current issues of the day. Indeed, it's difficult to tell the two parties apart. The Liberals support Bill C-51, the crazed Conservative anti-terrorism legislation that the NDP opposes. The Liberals are behind the Canadian military training mission to Ukraine. The NDP says the mission must first be approved by the House of Commons. You would have thought they might agree on that one. Taxes? Surely the Liberals and New Democrats must agree on increasing taxes to the rich? Then again... The Liberals would retain virtually all the Conservative tax measures, save for a small income-splitting tax cut. Only the NDP would actually raise corporate taxes. Canada is notoriously generous to its corporations when compared to other industrial economies. When it comes to environmental concerns, Mr Trudeau is happy to let the provinces take on climate change and global warming, as does Mr Harper. Mr Mulcair is committed to compulsory Canadian standards to reduce carbon emissions. But wait, there's even more: Mr Trudeau backs the Keystone XL pipeline and supports the further development of the oil sands, which sounds just like the current Prime Minister. Tom Mulcair opposes Keystone and speaks honestly about a "Dutch disease" of oil dependency in our country. On Quebec, both the Conservatives and the Liberals find common cause in backing the Clarity Act, while New Democrats endorse the Sherbrooke Declaration, which makes it easier for Quebec to separate, if ever that comes up again. The NDP has proposed a national child care program. The Conservatives would rather provide direct payments to parents. The Liberals, not surprisingly perhaps, given their record on the issue, are completely silent. 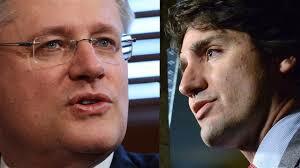 Ideologically, a minority Conservative government might work with the Liberals on a day to day basis. Perhaps the same might be true for a minority Liberal government. For his part, and in trying to appeal to the 60 percent of Canadians who oppose the present government, Mr Mulcair repeats that he is willing to do whatever it takes to defeat the Conservatives, including forming some sort of coalition with the Liberals, but Mr Trudeau refuses. Increasingly, as the election approaches, Mr Harper will warn Canadians that anything less than a Conservative majority will lead to a coalition of the NDP and Liberals. The reality could be a much different thing entirely.